That was my favorite slogan for the U.S. Army, and I was nonplussed with the change to “Army of One” in the early 2000′s. Thank goodness it has changed again, but I still don’t think “Army Strong” is quite as catchy. What’s the segue, you ask? After all, I’m an Air Force wife, and I shouldn’t be discussing the Army at all! Well, it’s a favor called in. A favor asked by family, and cookies made for non-family, so I guess it’s okay. Even so, I jokingly called my husband up (he’s currently visiting his father & family in West Virginia) and asked for permission before I tackled these cookies. He gave me the green light, of course, but he made me promise not to eat any of them! The family mentioned is my husband’s dear 3rd cousin Paula (who I’ve mentioned here before), and she requested the cookies as a gift to her best friend. That best friend is throwing a large party for her son Paul’s graduation next week. As monumental as that occasion is, Paul is then headed off to West Point just one week later! 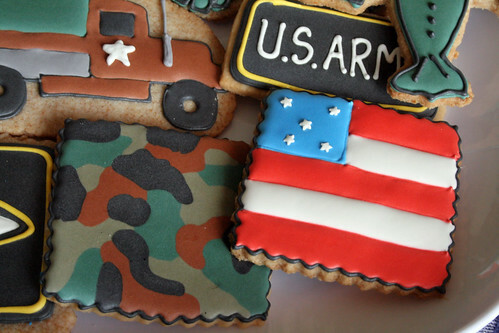 I’ve made camouflage and military-themed cookies before (though I’m too behind to have them featured on the blog yet! ), but I wasn’t thrilled with the technique. This time, however, I set my goal and prepared to “Aim High” (Air Force), and I think I got the job done right. 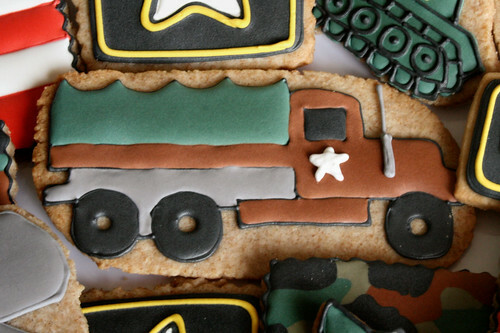 I completely forgot to take a picture of the coordinating Thank-You cookie, but it was a simple round with camouflage-colored dots. I realized it after I’d bagged & boxed all the cookies, and even though I hadn’t taped up the big box, I still considered it too late. I mailed off over 60+ cookies to Virginia, and I hope they are enjoyed at the party next weekend! They’ll be fresh for a while. Definitely a few weeks, at least. I love these! You’re so talented! All the best to Paul!! 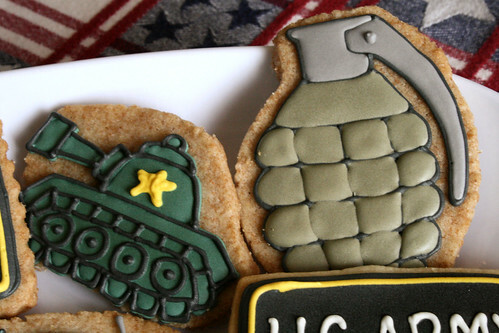 These cookies are (just like everything else you do) ah-mazing! Thank you, Becky! I’m so touched that you stopped by to share your thoughts on the cookies. Wonderful job on the cookies Nicole! 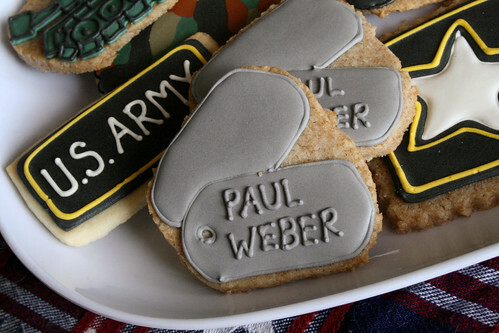 Love that you personalized the order with the dog tags. Congratulations to the newest member of West Point and all the best to him. Hello, I love the cookies. What is the process to place a order? These are really wonderful. Came to check on you. Wondering if thingsare getting better. 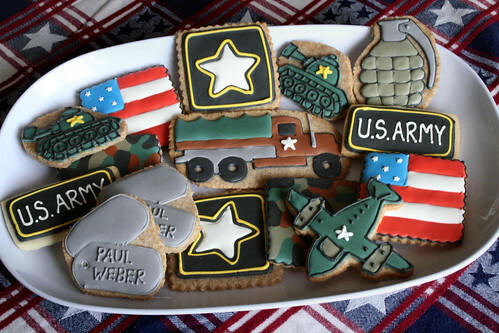 For shipping cookies over seas I’ve had it take up to 3 weeks getting to my husband’s FOB in Afghanistan they still were fresh. You just really have to pack them well. Yes, I’d say that’s pretty typical for overseas shipping. My hubby never complained about anything he received while deployed. 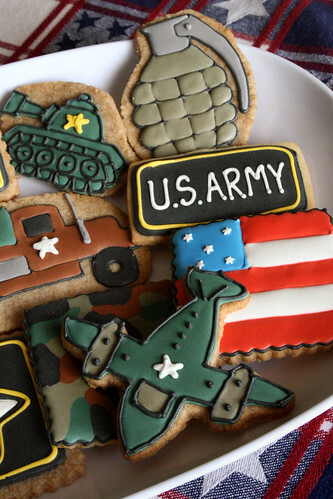 Nicole, the cookies look wonderful,my grandson is leaving for army baseittraining sept 19, and we are having a going away party for him, how much are your cookies and how long does it take to get them ?